A construction material that's stronger than steel but perfectly transparent is a classic sci-fi invention, and a research team at the University of Missouri is bringing it a little closer to reality with their blast-resistant glass. We already have blast-resistant glass, but it has a serious design flaw – it has to be made extremely thick to be effective. This makes it very heavy and hard to implement, since you can't just slip a five-inch slab of glass into a regular window frame. Missouri professor Sanjeev Khanna and his team, along with a team from the University of Sydney in Australia, is working to create blast-resistant glass that's effective even though it's only a quarter of an inch thick and very light. The project is funded by a Department of Homeland Security Science and Technology Directorate grant. The process of making the glass starts with long glass fibers that are only 15 to 25 micrometers in diameter (smaller than all but the finest human hairs). The fibers are woven into a cloth that is then bonded with liquid plastic resin and adhesive. The plastic/fiber section forms the core of a laminate, sandwiched between two thin sheets of glass. The resulting blast-resistant glass is perfectly transparent, avoiding the greenish tint of current blast-resistant glass thanks to the special formulation of the plastic resin. 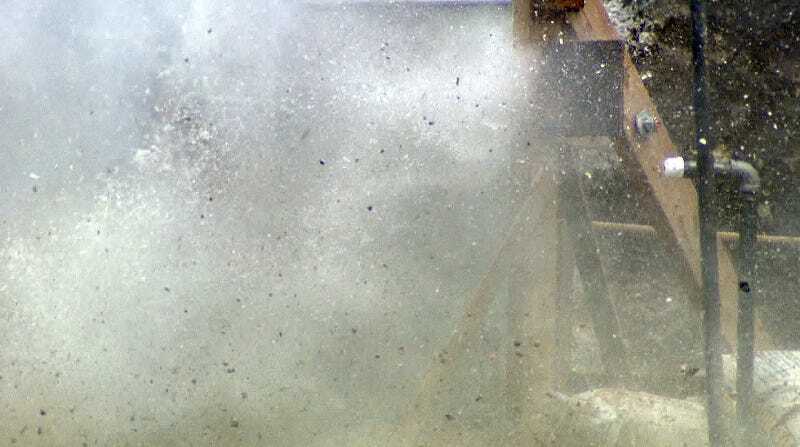 In testing, a small section of the glass was able to withstand a small explosion (the researchers did not offer specific details on the testing parameters – you can see footage of one test below). Future tests will use larger sections of glass in hopes of making the material commercially available within three years. Blast-resistant glass is an important engineering feat because of the danger posed by shattering windows in weather emergencies and terrorist attacks. Shards of glass account for a high proportion of deaths and serious injuries, even more than the force of the blast itself, in some bombing attacks, while windows are notoriously dangerous in tornadoes and hurricanes. Since we generally don't want to live our lives in windowless concrete bunkers, glass that can stand up that level of abuse without fragmenting could save lives. Source: EurekAlert! "A new kind of blast-resistant glass." Photos: University of Missouri College of Engineering.